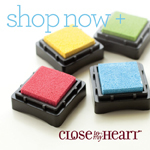 I did the TRIFECTA this week over at Design Dollies! It was a little hard until I realized I could paint the doilies and add a pale, shimmery yellow ticket that wouldn't clash with the color challenge! I did this for Let's Scrap Julie Bonner challenge. Its so pretty in real life. Sad that the photos don't show how pretty it is! I don't really know how to take a photo of a 2 page layout! I made this layout for Sketches 4 All! I made this using a sketch from Sketches for All and added ribbbon to it for them also. 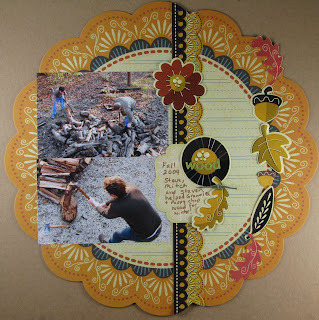 It also fits The Scrap Room's challenge this week to use scallops. American Crafts had a challenge also to use 3 patterned papers--so I found some of their paper that I thought matched up pretty well. This is definitely not my favorite layout, but it's finished! I made this for Sketches 4 All. Mel, from Australia, gave me that beautiful chipboard flourish. I dabbed it with a copper Adirondack paint dauber! That cute little stamped image with the bird/birdhouse is Stampin' Up! I colored it in with Tombow markers! 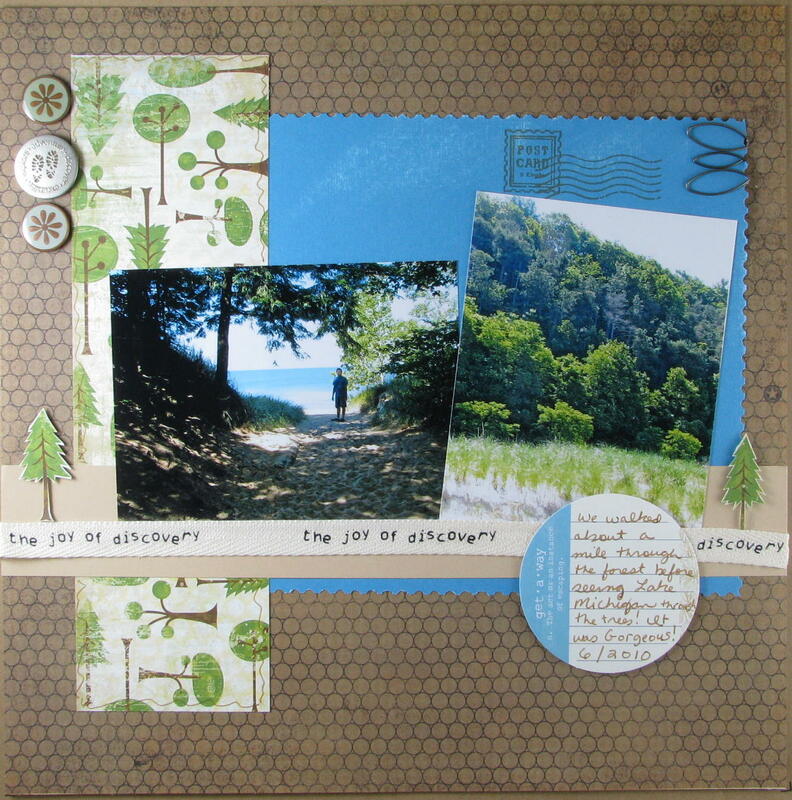 My friend Stacy HW sent me this beautiful Scenic Route paper, and I just had to use it immediately!! I used Sketch 142 from Sketch Inspiration and am entering it in The Paper Variety's Challenge 2. 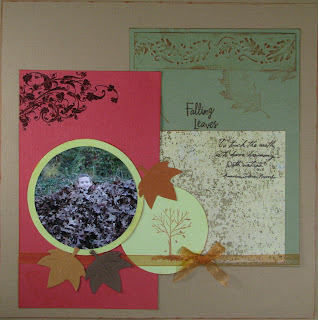 It had to have Autumn colors, a movie title (believe it or not there is a movie called Autumn Leaves), and borders. 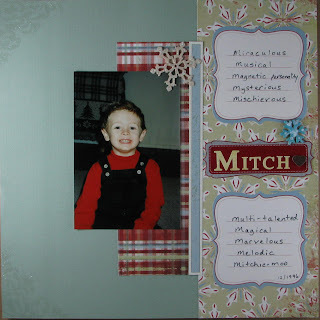 I used a border punch from Martha Stewart on the green paper (punch also from Stacy HW) and a Fiskars punch on the leaf paper! 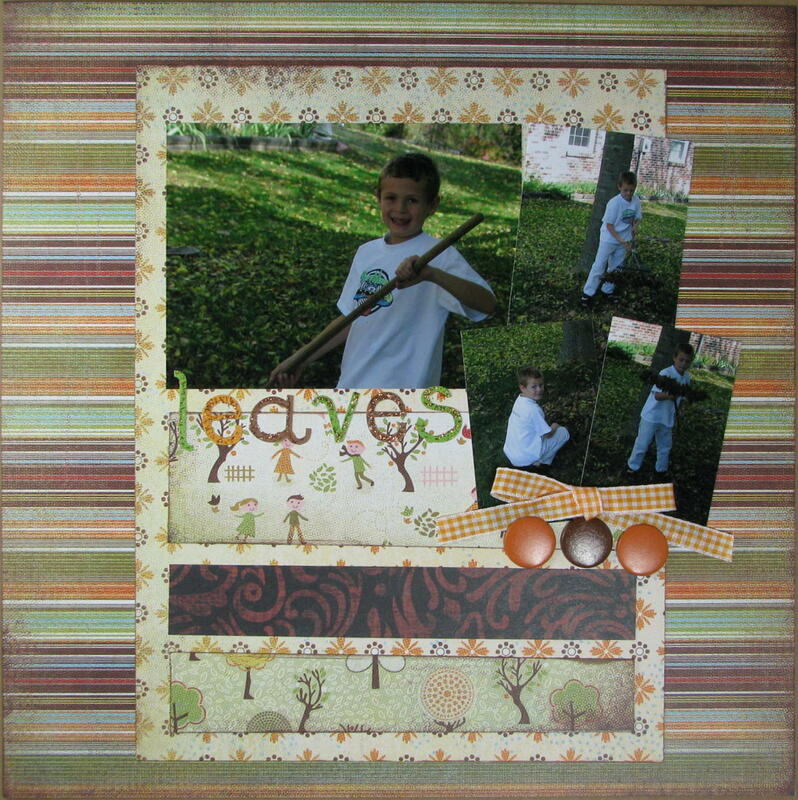 There is some orange twine around each pop-dotted leaf which were cut with my Sizzix. 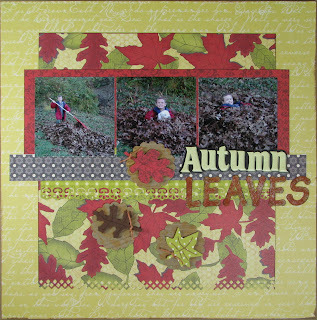 The word "LEAVES" was made with kraft paper which was inked a bunch and misted with a home-made shimmery mist! Abby, co-founder of The Paper Variety, sent me the "Autumn" sticker from W R Memory Keepers, Maple Grove line. I love this line and used it on a layout earlier this month! This also met the design element to include falling leaves over at Design Dollies this week. I think this is the first page I have done in a long time that wasn't for Sketches 4 All. I'm sure I'll get right back into doing some for them sometime this weekend! I created this for a Sketches 4 All challenge! I used Nikki Sivils! Yay! I was pretty happy with how this turned out! I have some baker's twine and scrabble tiles (Jolee's) on the banner and a cute owl from Buzz and Bloom and some REAL colored pencils on here! All the rest is My Sweet Cherry Pie. 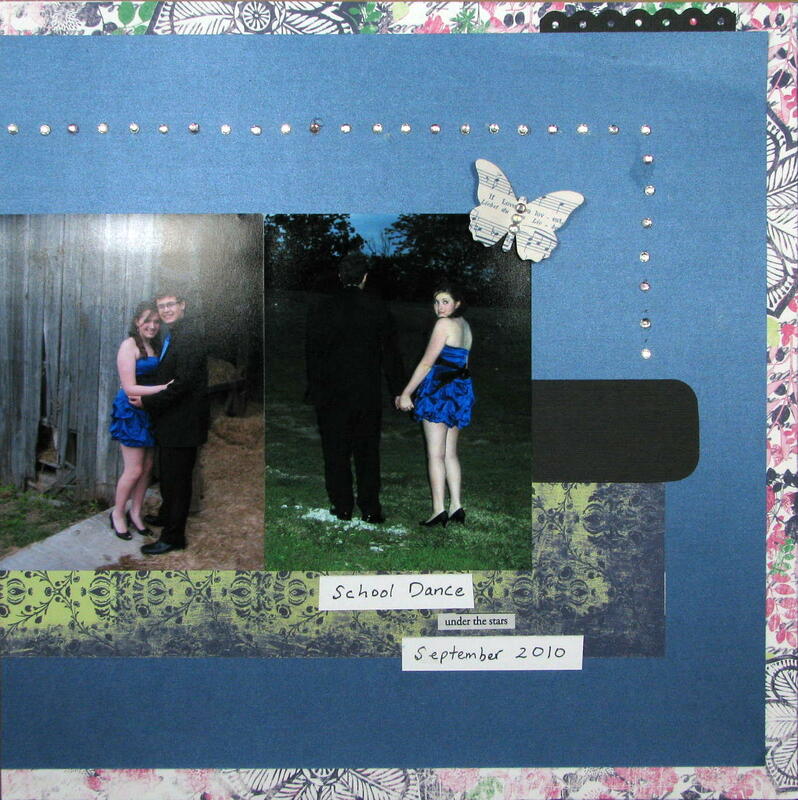 I am also entering this in Nikki's school challenge! I have no idea what costume my twin sister and I wore this year for Halloween, but I can sure see that we loved eating the candy! 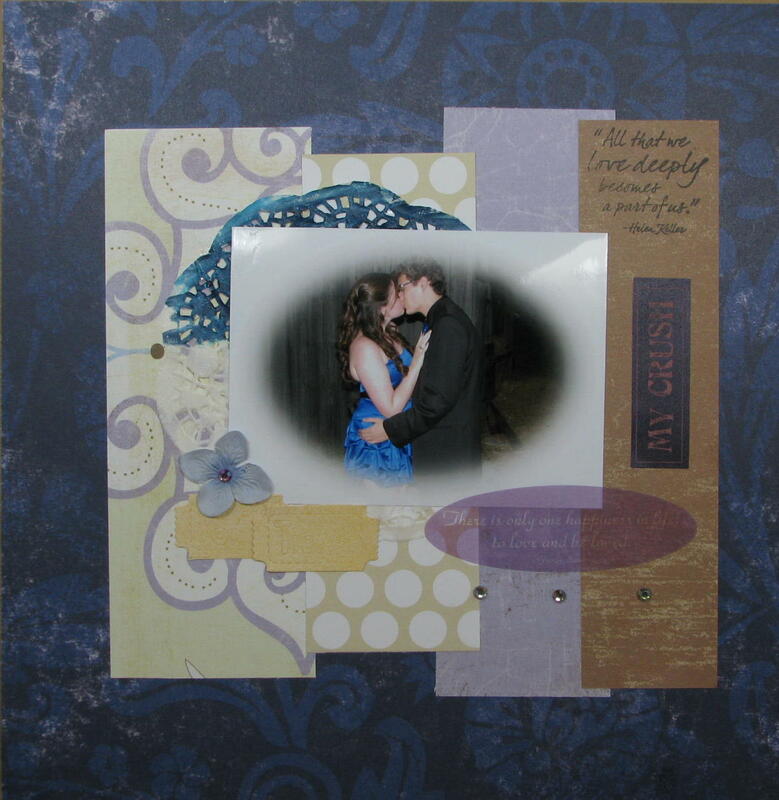 I used a lot of vendors on this layout: the majority of the papers are from Basic Grey. 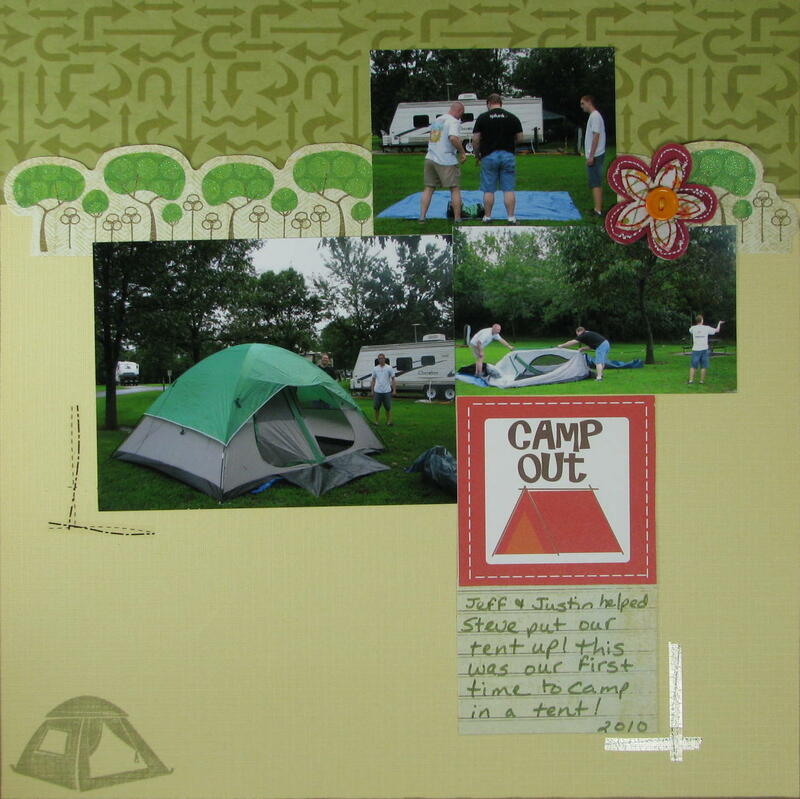 The photo corners were made from a sheet to which I had previously sprayed Krylon webbing paint. It makes such a cool effect--perfect for Halloween! I did this layout for Sketches 4 All. They have a fantastic contest going on right now! There are lots of prizes to be won! I created this using a sketch from Sketches 4 All. I also took a challenge by Toree at CK to use only patterned paper, some ribbon, either brads or eyelets and some glitter/Stickles. I thought it turned out pretty cute! 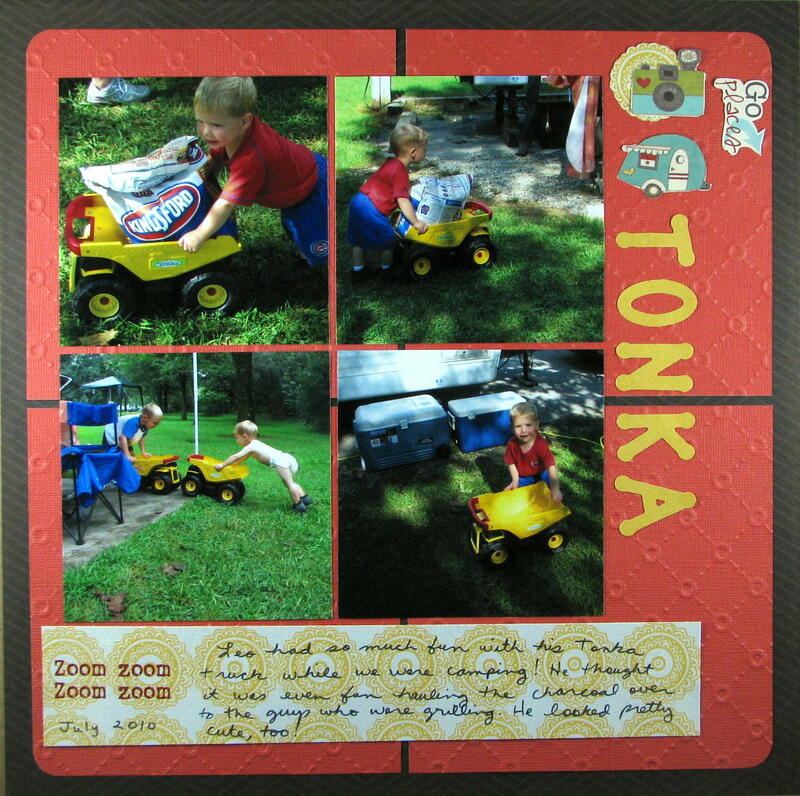 I made this layout using The Scrap Room's Weekly 37 sketch. I made this layout using Sketch Inspirations #140! It also fit The Scrap Room's Weekly 36. This is my kid up to his neck in leaves in 2002. This was the first Fall in the house we are currently living in! His dog, Cotton, was probably buried under the leaves right there with him! I made this layout as part of the Sketches for All/You Sketch-a-ton/back to school challenge and for Challenge Masters fall challenge. I made this layout of my niece and her boyfriend in their Prom clothes for The Paper Variety's first challenge! I used some elegant paper mixed with some "cute-sy" elements with glitter to make this more fun! Julie's dress has some sparkle to it, and I wanted it to seem sort of carefree just like teenagers should be with just a touch of elegance because they are all dressed up! Artful Delight has a challenge going on to make a layout showcasing something your child, grandchild or family member has done either at school or in a sport that has made you proud. I used #141 Sketch Inspiration. This layout shows my son in two roles: 1) the cool detective and 2) the nervous, creepy janitor! I've already scrapped Mitch in the detective roll--ironically also using a Sketch Inspiration sketch. It is here if you care to see it. I was really proud of Mitch that he took the time to learn two roles and voices which he had to interchange at the drop of a hat in the play! He did a fantastic job! He is so busy during the year that it was just a little icing on the cake to see him perform so well at the Evening of Drama (eod)! I hand-made the flower on the left. 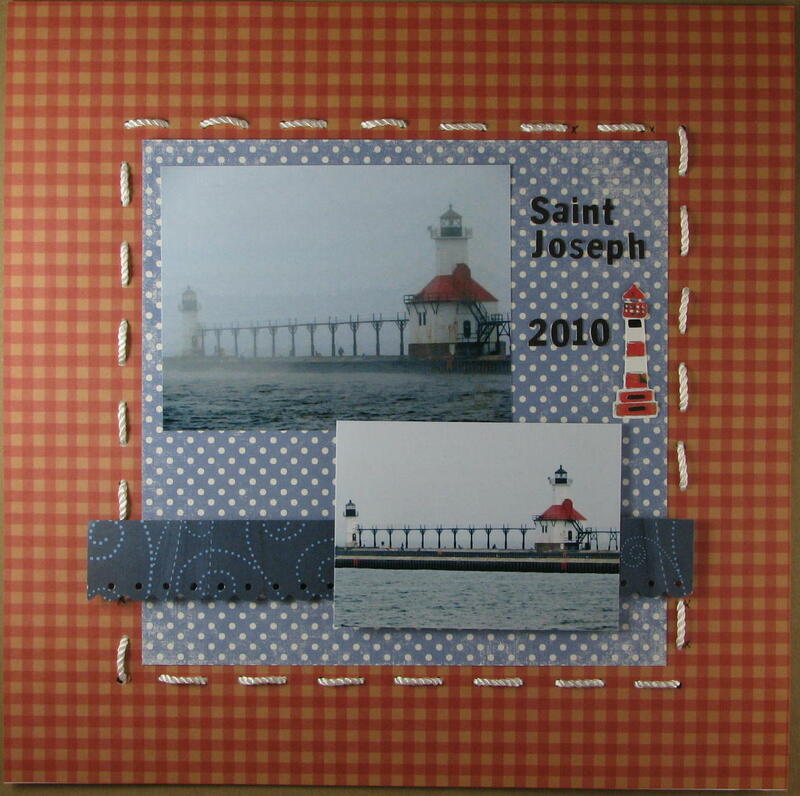 I fussy cut the star "border" out of a sheet from Core'dinations. It seems I am a little addicted to banners right now, so I added one for fun here! I tried to keep this a pretty masculine layout! Most of the paper is Bo Bunny - Mamarazzi which fits me to a tee! 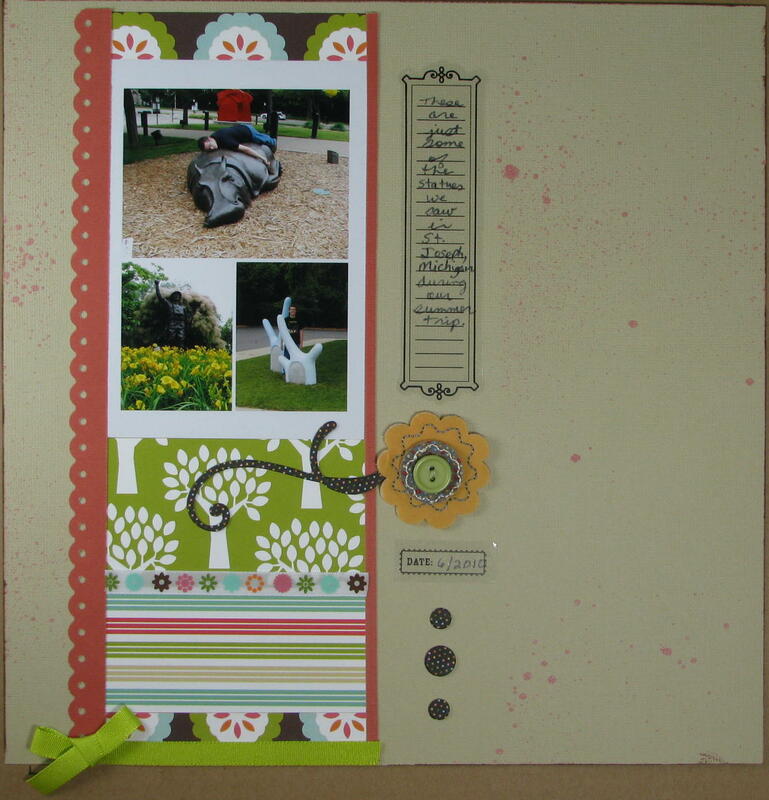 I made this layout as part of the Sketches for All/You Sketch-a-ton/back to school challenge! It runs until the end of September. They will have Nikki Sivils and Cherie from Sassy Lil' Sketches as a guest designers!! You really don't want to miss it! There are prizes to be won, so please come join in on the fun! 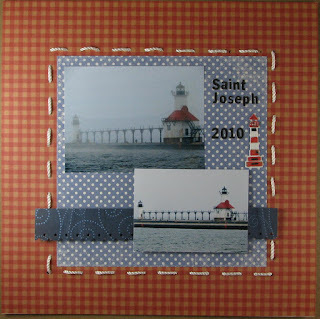 I used some We R Memory Keepers papers that I won from Abby who is one of the co-founders of The Paper Variety, a new challenge site! 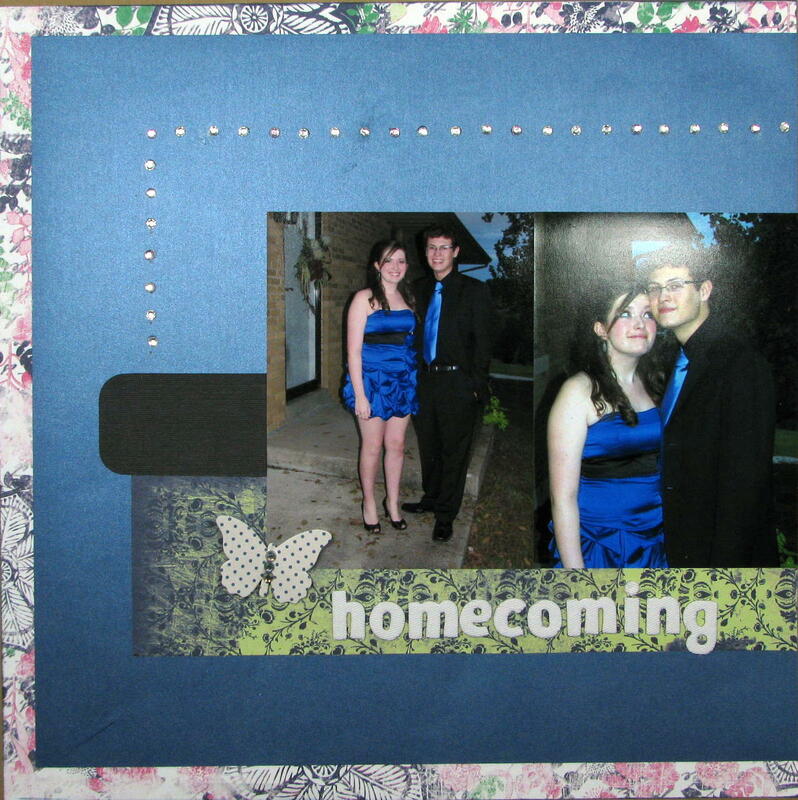 I made this layout I made this layout as part of the Sketches for All/You Sketch-a-ton/back to school challenge! It runs until the end of September. It has been a lot of fun so far and it doesn't really start until the weekend! 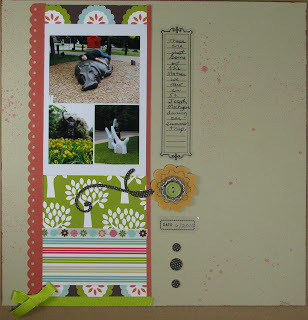 They will have Nikki Sivils as a guest designer and Cherie from Sassy Lil' Sketches!! There are prizes to be won, so please come join in on the fun! When I saw this sketch by Liz Qualman over at Sweet Peach Crop Shop, I knew that I had the perfect pictures to go with it! I thought it was so fun to use hearts instead of pennants for my banners! Since Mitch went to Florida with Haley's parents this summer, I didn't get as many photos as I normally would have gotten. 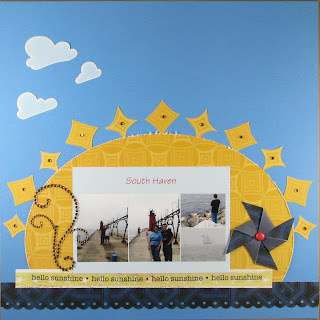 So, this layout plus this layout are the only layouts I'll do of them at the beach! The shot on the left is one of the "standard" poses we usually get--I love the goofy sideways glance Haley gives Mitch in it! This is one GROOVY layout! I totally forgot how my mom decorated our house back then! My dad made our kitchen cabinets, and Mom painted them and made the curtains. 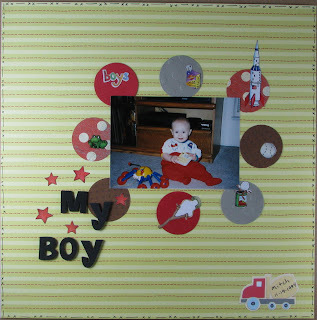 I made this layout by scraplifting Mandy Starner's Midway Lights September layout over at Up The Street. This is their September challenge. I am also entering it in the weekly American Crafts contest. This week you are to scrap a page of yourself with at least 2 AC products! 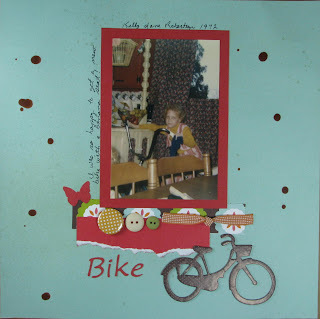 Practically my whole layout is American Crafts! 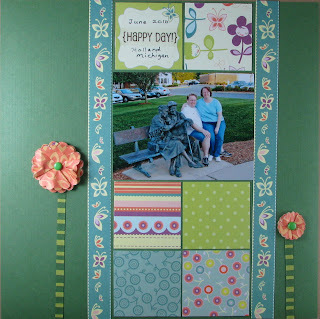 I made this for Sketchy Thursday's 9/9 weekly layout and for the Scrap it With a Song challenge 21. 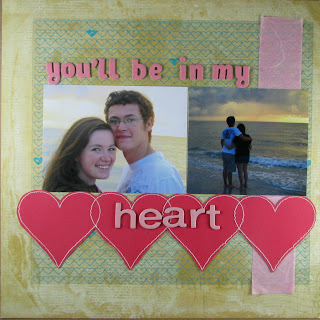 It's of my son and his girlfriend in Florida this summer! I placed a Hambly screen print overlay over a really cool DCWV sheet. The pink strip on the side is mulberry paper and the hearts were cut from Anna Griffin. The top letters are fabric Thickers and the bottom are from My Little Shoebox. Simple, but sweet, I thought! I made this for Brenda's challenge at Sketches for All/You. I used a lot of stuff from the Peace kit from Scrapbooking from the Inside Out! The bracketed journal spots are from Anna Griffin but couldn't be more perfect for the My Mind's Eye paper from the kit! 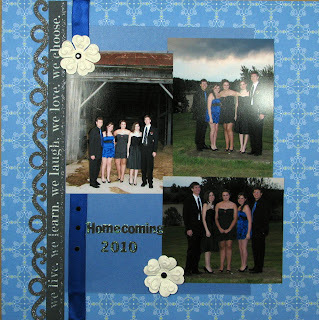 I also clear embossed some CTMH flourishes on the left corners of the layout to kind of ground it! I added some very sparkly Stickles to the snowflake by the picture and some Distress Crackle paint and Rock Candy Stickles to the snowflake by the title! 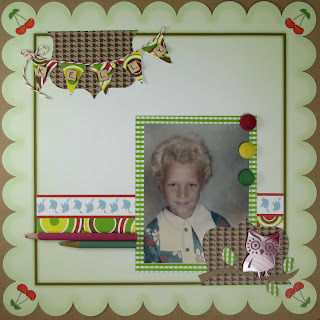 I did a Double at Design Dollies this week! The colors and the sketch were all I could work into my layout! The flower was made by Jessica in Australia. The white flowers were made by my good friend and neighbor, Mary!!! I feel so lucky to have these to use on my layouts! 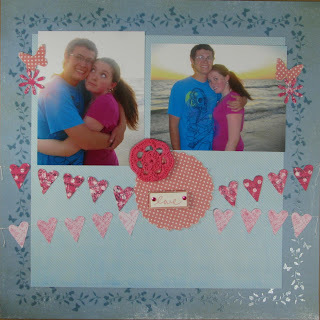 I made this for Shannon's (one of the DT member) challenges during Scrapbook Challenge's blog hop! You were to make a layout about a name! I chose to use some photos of myself from our Michigan trip. This one was at Meijer Gardens! I give a little detail about my name--what it means and why I was named Kelly! I'm also entering into Valerie's challenge to use what you have for Sketches for You/All. 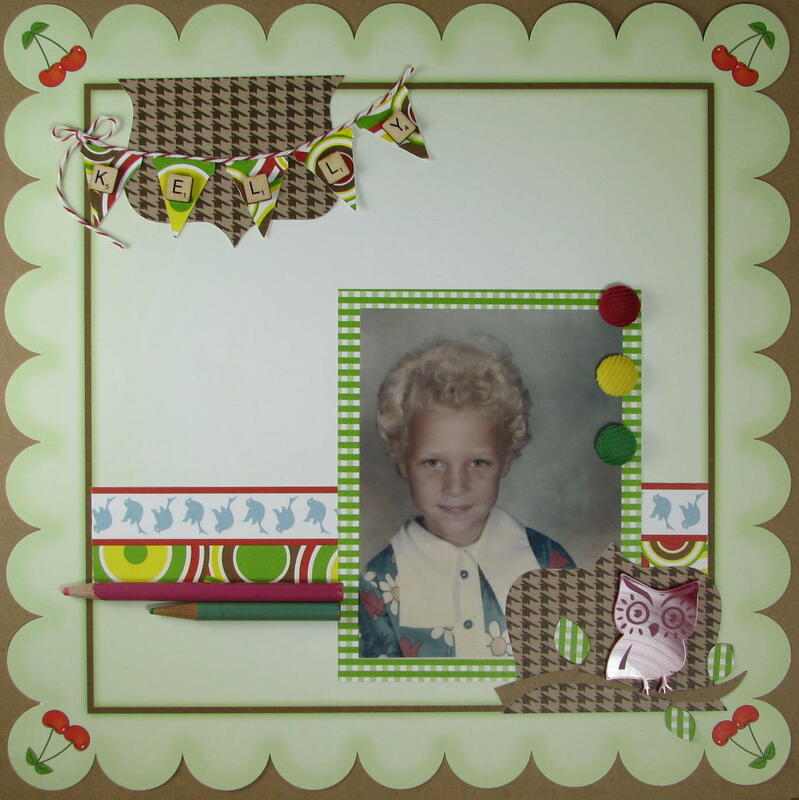 I used some several year old CTMH Let's Get Together paper, ribbons, buttons and spirals that I was hoarding saving for the perfect photos! I was the RANDOM winner of the prize of flowers for this challenge! Yay! I was excited! I made this for Natalie's (one of the DT member) challenges during Scrapbook Challenge's blog hop! You were to use fabric! I fussy cut some Dear Lizzy, used a hand-made crochet flower from Jessica; a CTMH metal piece, some stickers & Flair, and I sanded some words in! It's interesting to go back and look at all of these older pictures! My mom finally let me have a couple of me when I was little! I made this for Scrapfit's Workout 27 using their sketch. It also meets the requirements over at Sweet Peach Crop Shop this week to use at least 8 circles! Mitch was a little over 7 months here! He was always so happy and cheerful. 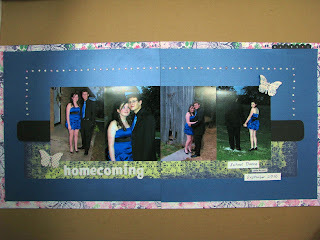 I just love going back and scrapbooking these older pictures! 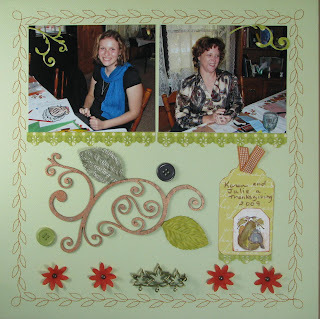 I made the border "stitching" by hand! Yes, that's right! It's their web page!!! I used Earth Love to make this fun little scraplift! 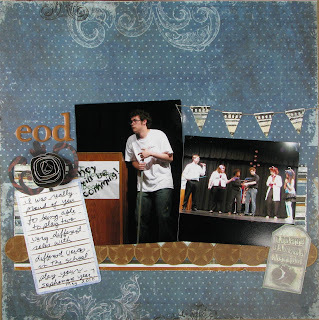 I made this for a new to me challenge site called: the Scraproom! It is for their Week #35 Weekly Challenge! 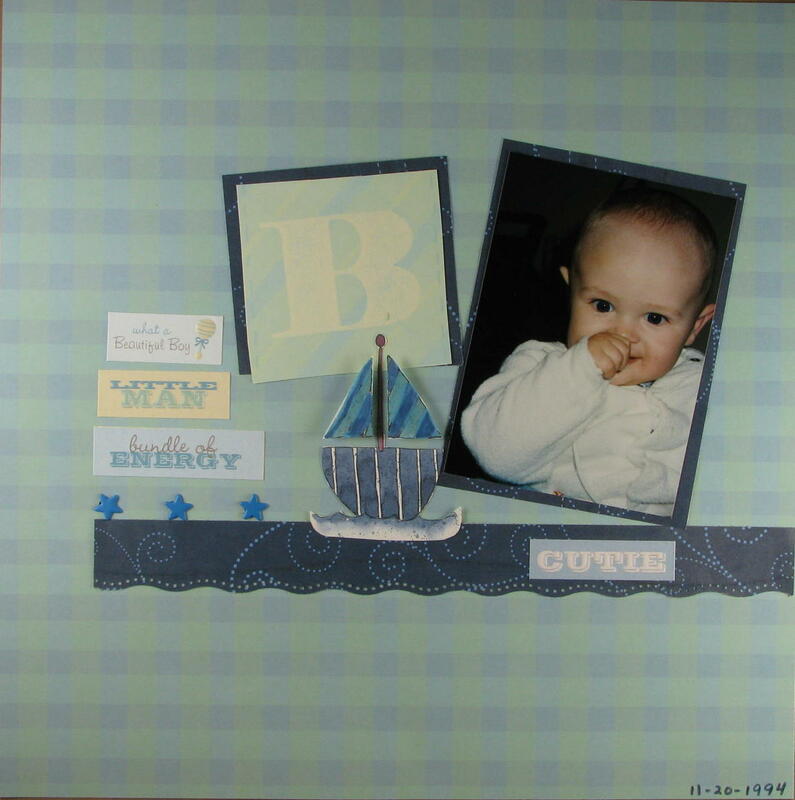 Much of this layout came from the Discovery kit over at Scrapbooking from the Inside Out! I just love their kits!!!!! I created this using a sketch from Scrapbook Challenges. They are having a blog hop this weekend and this sketch is part of it!!! 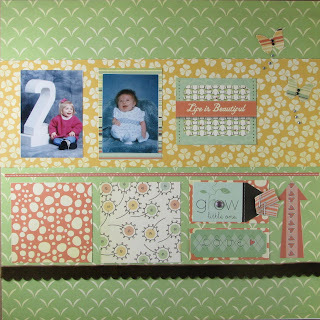 You can click on the link: http://scrapbookchallenges.ning.com to participate! 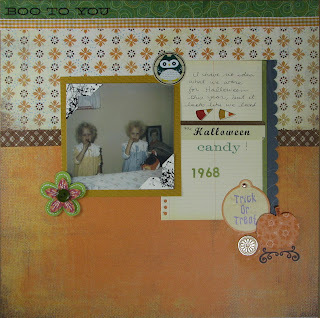 The blog hop starts at Pamela's blog: (http://www.pamelasworldofscrap.blogspot.com/). 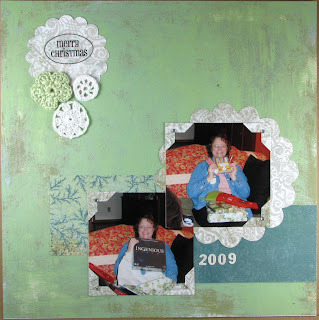 I'm creating this post to be part of theHop On board to view members' blogs here: (http://scrapbookchallenges.ning.com/forum/topics/seasons-of-change-...). Join in and have some fun! There are some amazing prizes to be won, including Cosmo Cricket's Pixie-Licious, which I've used in my layout! The box flowers are so easy, and I got the instructions from Cosmo Cricket! Steve Working while we were on Vacation! I did this layout for a tone-on-tone challenge and a use a stamp as your title challenge at Sketches for You!! All of the jewels are white but some of them appear to be pink on the photo... Don't know why... Also entered in Scrap Our Stash! After a week of doing nothing at Design Dollies, I completed the Trifecta this week!! 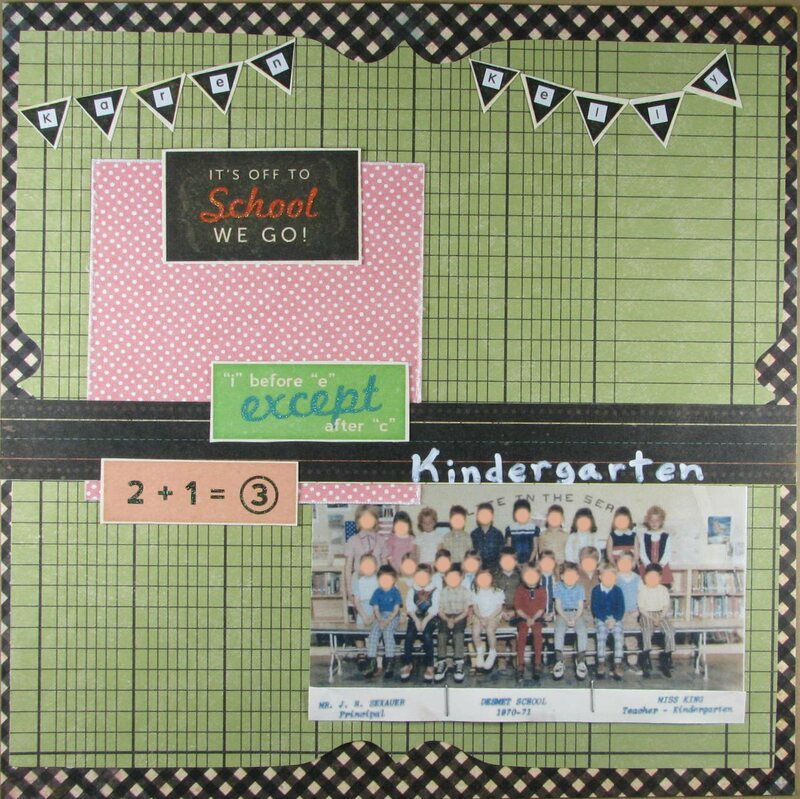 This is a layout about my twin sister and my Kindergarten year in school!!! Even though Karen's name is listed first (she was born first), I am the one whose face isn't blurred on the left, and Karen is on the other end of the row! That was the only year they put us in the same class. I guess they were afraid we relied too much on each other rather than making new friends. I really don't know. 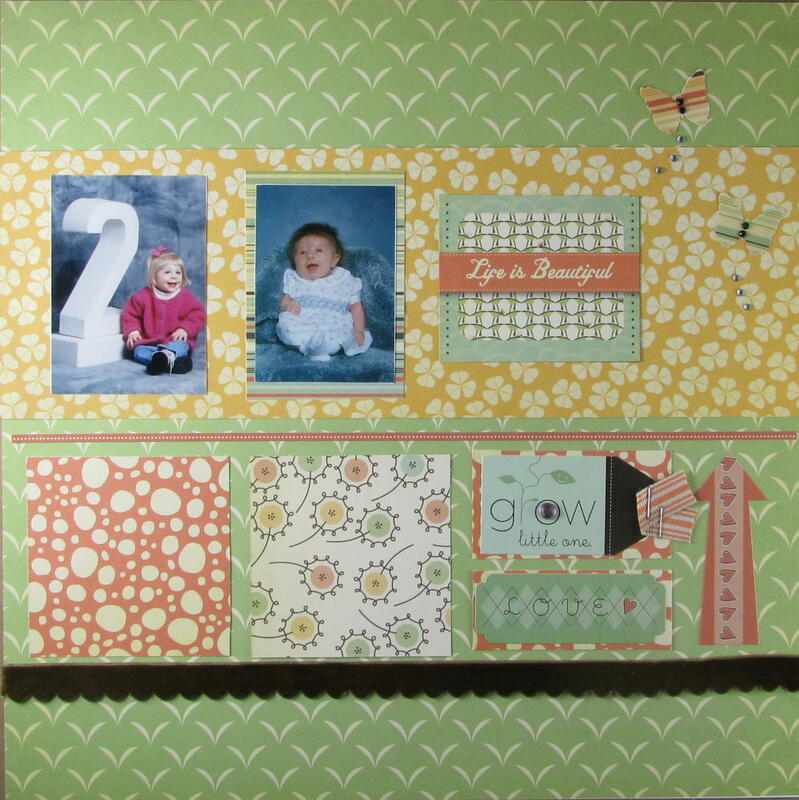 I used fabric (American Crafts, Dear Lizzy -- the pink with white polka dots) to meet The Studio challenge to use fabric!!! I frayed the edges just a bit on the fabric. I had a lot of fun making this layout! At first I was worried that I wouldn't be able to make the colors or the design work for me, but I like how it turned out! As you can tell, I changed the circle elements to some fun school themed sayings. I also added a couple of cute banners! P.S. 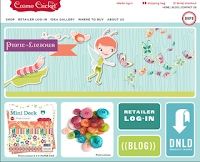 Did you hear about the blog hop/celebration at Lucky Girl's? Click on the link to check it out! 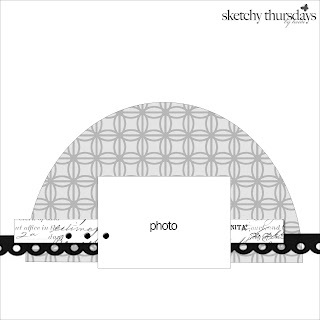 I used Sketchy Thursday's sketch this week to create this layout! 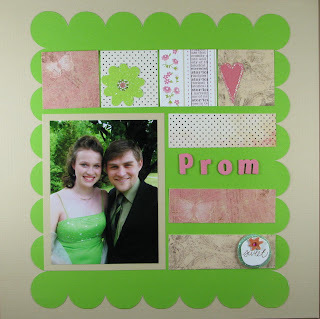 I'm entering it in The Studio to DIY (the pinwheel) and Stacy's weekly challenge over at Sketches for You. By the way, I'm thrilled to be the guest designer over at Sketches for You for September. I'll be issuing a challenge with a small RAK over there. I hope you will join me. I'll post about it here on the blog, too! I was lucky enough to win some SRM Stickers which is what you see right under the photo!